Elizabeth A. Farrell - Dughi, Hewit & Domalewski, P.C. Elizabeth Farrell joined Dughi, Hewit & Domalewski in August of 2016, following a judicial clerkship with the Honorable Mark P. Ciarrocca, J.S.C. in Union County. Since joining the Firm, Ms. Farrell has gained significant experience defending medical malpractice matters, representing physicians and other health care providers, including all stages of discovery, taking and defending depositions, conducting extensive motion practice, and representation at trial as second chair in two cases with Mr. Dughi. Her efforts in the medical malpractice field has included the preparation of various appellate pleadings. Ms. Farrell also works closely with our senior attorneys in the Firm’s complex civil litigation practice group performing legal analysis and discovery and motion support in a wide range of matters. Her work includes assisting in the Firm’s defense of pharmaceutical clients in State Multicounty and Federal Multidistrict litigation. 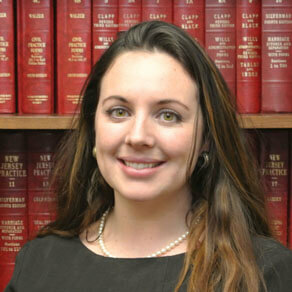 Recently, Ms. Farrell has become an integral part of the Firm’s growing criminal defense practice. In addition to representation of clients in state court matters, she has second chaired a Federal District Court RICO trial. Ms. Farrell is currently the secretary of the Richard J. Hughes American Inn of Court, an organization focused on civil and criminal litigation. She is an active member of the New Jersey State Bar Association and serves on various committees in the NJSBA Young Lawyers Division. Ms. Farrell is also active in the Union County Bar Association, and recently organizing a county-wide UCBA Young Lawyer’s Breakfast hosted by our Firm. Ms. Farrell received her undergraduate degree in Political Science from Colgate University and her juris doctorate degree from Washington and Lee University School of Law, where she was the Lead Article Editor for the Journal of Energy, Climate and the Environment. She was also Runner-up and ABA Regional Competitor in the Client Counseling Competition, a Semifinalist in the Robert J. Grey, Jr. Negotiations Competition, and a Semifinalist in the Mediation Competition.